“That’s how it always begins. Very small.” This quote from John Carpenter’s Big Trouble in Little China opens Plague Town, the first book in author Dana Fredsti’s Ashley Parker series. Any cult-film buff knows the reference and probably cracks a smile at its inclusion. If you’re not immediately charmed by such a nod, then set the book down and find something else to read. The inbuilt audience for Fredsti’s 2012 zombie action yarn and its new sequel, Plague Nation (available April 9, 2013), already has an appreciation for such cultish references, not to mention gory violence and snarky humor. Fredsti’s current and future readers have watched and loved all things in the Whedonverse; they’ve savored Max Brooks’ World War Z; they regularly debate with friends how best to survive in a zombie apocalypse; they have blind admiration for George A. Romero and perhaps equal admiration for Amy Heckerling too. For the uninitiated, Plague Town centers on 29-year-old Ashley Parker, a recent divorcée who’s going back to school in Redwood Grove, CA. She’s a fiery, stubborn, strong-headed female heroine who also happens to talk and sometimes think like a teenager, using slang such as “Epic fail!” and “Tipsy much?” in both dialogue and her first-person account. According to Fredsti, Ashley (nicknamed Ash after Bruce Campbell’s chainsaw-armed hero from the Evil Dead movies) acts half her age because she’s “trying to fit in with a bunch of kids as much as a decade younger than she is.” However much her behavior is just an attempt at social absorption as the author suggests, Ashley’s internal process has been shaped as well. The first-person narratives feature Ashley talking and thinking tweenspeak one moment and referencing M*A*S*H the next. Incongruous or not, our heroine always has something on her mind and it’s usually brazen. At least she’s not the indecisive Bella Swan sort (Fredsti acknowledges the Stephenie Meyer character “set back strong heroines by a few decades”). “Basically [Ashley is] trying to step back into the life she left when she got married,” Fredsti clarifies. “I’ve always had friends in a large age range, as well as spent a lot of time with my friends’ kids, so that helped with some of the contemporary slang. I admit that the expression ‘Epic fail’ was not in my vocabulary until [a friend] introduced me to it. As far as the majority of the narrative, however, there wasn’t a conscious choice to infuse it with ‘hip’ vernacular. That’s just how my mind works.” Nevertheless, one gets the impression that Fredsti’s just a few steps away from introducing emoticons into her work. For a certain segment of the audience, this kind of writing is unforgivable. But I can imagine a wider group—the culture of must-soak-up-anything-to-do-with-zombies—eating this stuff up. Once the reader learns to look past Ashley’s neverending pop-culture jargon, they can settle into Fredsti’s actionized zombie plague scenario that, by the end of the second book, threatens to spread from Redwood Grove all across America. (Her third book in the planned trilogy, Plague World, is due next year, and the title suggests the growing scope.) The mechanics of how the virus spreads are familiar, as is the faction with which Ashley finds safe haven. Rescued by a university-bound assembly of underground scientists and military personnel, Ashley discovers she’s one a few rare “wild cards” immune to the zombie virus. As a result, she’s imbued with heightened senses and strength, trains to become a sword-swinging badass, and becomes a member of an elite zombie-killing squad. They’re overseen by a top-secret group that’s been preventing zombie outbreaks for centuries (the books attribute Atlantis and Pompeii’s disasters to mass zombie quarantines). When I asked Fredsti if zombies could still be scary despite being oversaturated in movies, comics, videogames, and television, she replied, “It all depends on the individual(s) handling the subject matter. Sure, they’ve lost some of their shock value (a person can only see so many evisceration scenes with people getting their guts pulled out and eaten without it losing its impact), but that doesn’t mean writers and filmmakers can’t still do their job of disturbing/creeping out their readers and audience.” One such creepy moment from Plague Town stuck with me more than any other: A non-zombie father is discovered eating his wife and child, muttering to himself with a mouthful of flesh. But why? This haunting moment leads to one of several unique revelations in the Ashley Parker series, making these books derivative yet laced with just the right amount of novelty to set them apart. Whether this all sounds entertaining or just plain silly depends largely on you, and your willingness to embrace the books’ undeniable Syfy Channel Original quality (also referenced in the books). These are swift and easy reads marked by Fredsti’s fast pacing. 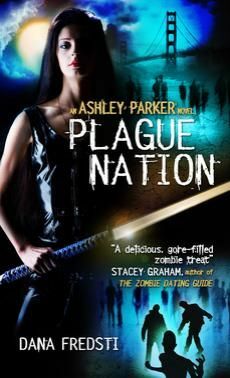 In particular, the superior Plague Nation moves with breakneck velocity and offers more action than Plague Town, which, in its long passages of exposition and Ashley’s back-and-forth with moody boyfriend Gabriel, might lose some readers. Moreover, sometimes the author’s overreliance on movie references wears thin, as does her use of contemporary slang. But then I’m something of a snob when it comes to such characteristics in novels (authors should rely more on their descriptive powers than the reader’s knowledge of movies to set the scene). Still, the same zombie fanatics that made Resident Evil a blockbuster film franchise and The Walking Dead a hit TV series will surely love Fredsti’s brand of action-horror. Plague Town and Plague Nation are two books shaped by the phenomenon of the zombie in pop-culture. Each employs familiar tropes mashed together from existing zombie movies, comics, and television shows. Each acknowledges, either directly or indirectly, the author’s work as a blend of Buffy the Vampire Slayer with countless zombie-themed sources. Fredsti doesn’t seem to have any illusions about her work in that regard. In style and content, her inspirations are always present, intentional or not. There’s a definite degree of fun to be had for readers who will catch her references and sense those inspirations. Others might not be able to get beyond the corny covers or movie-heavy imagery. In short, if a yarn about a sword-wielding, zombie-killing heroine sounds appealing to you, chances are there’s something here for you to relish. Thanks to Titan Books for sending review copies of the books. A special thanks to Dana Fredsti for her candid responses to my questions. You can order both Plague Town and Plague Nation from Titan’s website.